The temperature at 7:45AM was 53.0F under scattered clouds. By 9:45AM it had climbed to 67.7F with scattered clouds still. They were stating scattered clouds and the temperature had climbed to 72.0F by 11AM. We often mention our son Mitch and his daughter Josie, our only grandchild in these daily reports. This is a photo of them in a swimming pool on February 25th. The two of them are like a couple of otters in the water. 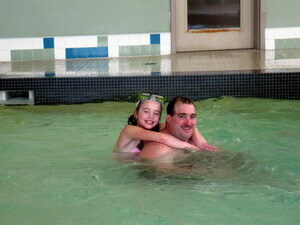 The lessons have no doubt helped but a lot of it is their natural love of the water. They could wear out an ocean full of it. Josie is in the pool continually at Evangeline Beach. By noon it was 75.2F under mostly cloudy skies. It actually looked like a high level haze but it did not affect the sun. The sun shone brightly and was hot. We had the awnings out, vents, windows and door open. Joan and Karen went for a swim and left me to tend to the oven. They were brave. At noon or 1900UTC I gave a couple of good CQ's on 14023 kilohertz but worked no one. One was at 18WPM and the other at 25WPM. There was a bit of chatter on but I did not hear a CQ. The Morse code appears to be faster in this area of the band. The slower speed appear farther up the band. No doubt I should have been keeping a watch up there. At 3PM the temperature was 78.1F under partly cloudy skies. It was hard to find the partly cloudy there was so little of it. Simply a bit of alto cumulus towards the south. And a few wisps of cirrus to the north. Amazing! Just before supper four or five stations came up on 14023 kilohertz and actually called V31JP in Belize the normal old fashioned way. We did not expect to hear anything like that. Supper was ready soon after that and I had no time to monitor them further. The radio was turned off for the day shortly after we heard them. We had one fantastic supper. Joan put on a feast of spare ribs. They were so good even I went for seconds. It was topped off with apple crust pie and vanilla ice cream. There were five of us. Joan, Karen, Bonnie, Bob and I. Bonnie is married to Karen's cousin who was not here. And believe it or not we forgot to take a photo of the supper. I had gone out and taken a couple of photographs before the supper with the idea of taking more during the supper. This is what it looked like before the supper. The little white electric oven down by the trailer's patio is cooking the ribs. The ones I looked after while Joan and Karen went swimming. 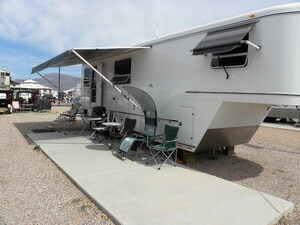 When we had the trailer built we had those electric plugs installed so we do not have to fry and cook in the trailer. The little barbeque is next to the little electric oven and it works the “finest kind”. Joan and I had things cleaned up and the dishes done at 7:45PM at which time the temperature was 64.9F under clear skies. We left the awnings up but closed things up. It gets cool at night. Our day ended when the movie ended. The temperature was 60.6F under a clear sky. That was the day and another good one was history.